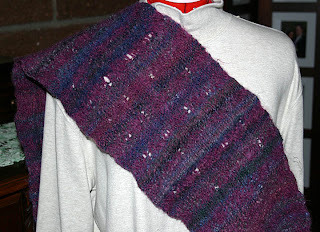 Before leaving this morning for Wenona's and a crafting afternoon, I took photos of the scarf I finished last night. 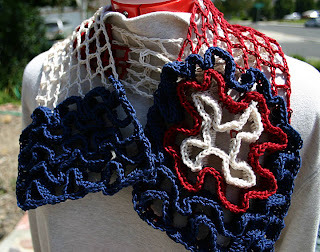 I wanted a summer scarf, something I could wear for July 4th without succumbing to heat stroke. This is Tahki Cotton Classic in a lattice pattern, with 'fireworks' crocheted in what Ruthie Marks calls 'dragon curves'. I'm really pleased with how it turned out and reaction at my LYS was positive when I dropped this off today; it's the class sample for next Tuesday's crochet block-a-month class. I signed up for a rigid heddle class about a month ago and knew I'd enjoy it; I've taken classes with Deborah before and she's a truly gifted teacher. But I didn't know that I'd love this pattern and the finished product. Class started at 5:30 and I cut the finished scarf off the loom at 10:00. That's fast. 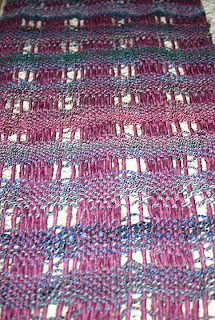 Warp (the long threads) is violet Lamb's Pride Worsted and weft is some of my newbie handspun that I've had stashed away for a couple of years. 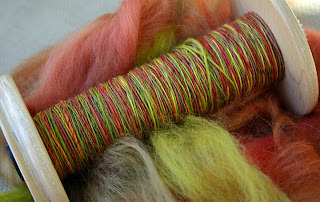 It's too thick/thin, over/under spun to use for crochet or knitting but it's perfect for felting. I brought the woven scarf home, threw it in the washer for 5 minutes - shrinking the length from 57" to 43" (24.5% shrinkage) - and voila - my newest scarf. Love.It. 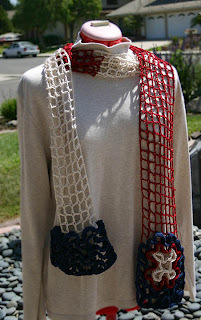 I've got 2 or 3 more scarves planned out in my head that I hope to make before our next class in 2 weeks. Tour de Fleece update: Still spinning away. 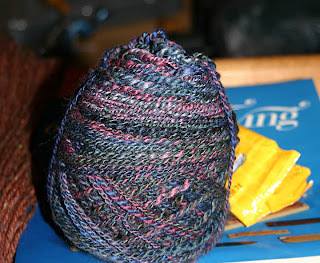 Yesterday I started work on this merino/mohair blend that's been in my stash for over a year. I love the colors but spinning merino is not one of my favorite things (wish I'd figured that out before I bought so much of it. sigh.) I just want to get through this a quickly as possible so I can spin more 'good stuff'. Repeat after me - stashbusting is good, stashbusting is good, stashbusting is good . . . . .